At Blommer, we believe sustainability efforts in the cocoa community will benefit everyone involved in the cocoa supply chain through better quality, more consistent product and a sustainable future for the industry. Our industry has a responsibility to invest in the cocoa growing regions by providing the tools, technology and training necessary for the farmer to develop the skills required to increase yields, improve quality and become a better educated seller to ensure the long term sustainability of the cocoa industry. Blommer’s Sustainable Origins™ programs reach from West Africa to the Americas and Indonesia. To date, 80,000 farmers participated in our sustainability programs. Per our 2012 commitment, we continue to provide solutions to our customers to enable them to achieve their sustainability goals as well as our own goals by 2020. This multi-year program was initiated in 2012 in Ecuador in collaboration with the regional Ecuadorian government and Cimarron Estates. Next to training at least 1,200 farmers in comprehensive good agricultural on- and off farm practices, the program provides more than 1 million high-yield seedlings. Blommer thereby provides the commercial link to the farm base. The Amazon Project in Ecuador was jointly implemented together with NGO Conservacion & Desarrollo for a period of two years. The program constructed 225 solar dryers and improved general post-harvest handling including the fermentation process. This has resulted in farmers seeing a 30 percent increase in prices for higher-quality cocoa. PACTS is a $3 million cocoa sustainability partnership supporting farmers in Côte d’Ivoire, West Africa. Formed in May 2010, PACTS was developed in conjunction with Cemoi Chocolatier of France and Petra Foods of Southeast Asia with the mission to improve the supply of high-quality, fermented cocoa beans while also supporting the livelihood of local farming communities. The program facilitates fermentation centers and dryers that allow for enhanced post-harvest management resulting in superior and more consistent bean quality. In coordination with the Ivorian extension agency CNRA, the program provides scientifically selected bud woods to PACTS for distribution to cooperative members with the purpose of rehabilitating old farm land. Established in 2004, Blommer and Olam formalized their commercial link with GrowCocoa, a joint venture established to encourage long-term commitment and investment in the cocoa supply chain, improve the livelihoods of cocoa communities, and develop strategic partnerships with governments, national institutions, NGOs and funding agencies. Under the GrowCocoa partnership, Blommer and Olam support sustainability programs inclusive of initiatives in Indonesia and Côte d’Ivoire, which are envisaged to be expanded into other geographical regions. Learn more. In 2013, Blommer in partnership with Ecom Agroindustrial Corporation, launched a new farmer program in Côte d’Ivoire. Alongside an extensive all year round on-farm training package, the program supports Cooperatives and their cocoa farming communities to develop their own nurseries and clonal gardens to ensure the long term availability of improved planting material. In addition to the training provided on good agricultural practices on demonstration plots, farmers are trained on the importance of keeping written records of their production costs and income, as well the basic gross margin calculation of sustainable cocoa farming on small land plots. With a better understanding of income and cost across all crops on their farms, farmers can make more informed decisions about their farm management and, most importantly, can better plan their production activities so that they will be able to finance themselves the agricultural inputs required for sustainable cocoa production. The partnership will improve the farmers’ access to such inputs by making them available on Cooperative level. The project addresses the needs of smallholder cacao farmers in the Dominican Republic whose development is constrained by climate change. The objective is to enable small-scale cocoa farmers to become more resilient to climate change. The pilot project will implement the use of the Sustainable Agriculture Network (SAN) Climate Module with RA certified cocoa farmers. It is expected that through this training farming communities will better adapt to the challenges of a changing climate implementing policies, procedures and best management practices. Certified farms will become more efficient through reducing emissions, increasing their carbon stocks through tree planting and other strategies such as more efficient use of nitrogen fertilizers, wastewater treatment, and management of agricultural residues. Blommer is a founding member of the WCF which promotes a sustainable cocoa economy through economic and social development, as well as environmental stewardship in cocoa-growing communities. Founded in 2000, the WCF is an international membership organization representing more than 100 members across the cocoa value chain. The foundation works through public-private partnerships that bring together donors, industry members, producing country governments, research institutes and NGOs to achieve its goals. The World Cocoa Foundation’s CocoaLink Public-Private Partnership uses two-way mobile phone communications to reach thousands of cocoa farmers in West Africa. Information is shared with cocoa farmers about farming and social issues, such as child labor, to support them in applying good agricultural practices that improve their incomes and livelihoods. CocoaLink reaches more than 40,000 farmers in Ghana and will operate in Côte d’Ivoire in 2014. 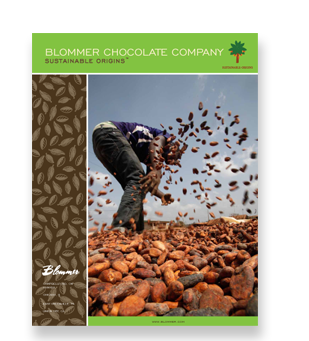 In 2009, Blommer joined forces with the Bill and Melinda Gates Foundation, as well as other industry members, to launch the Cocoa Livelihoods Program. The comprehensive $40 million initiative aims to reach 200,000 farmers in five Central and West African countries. Its goal is to double the income of cocoa smallholder family farmers through farmer training on good farm practices as well as sustainable production techniques. The African Cocoa Initiative is a public-private partnership dedicated to supporting sustainable productivity growth and improved food security on diversified cocoa farms in Cameroon, Côte d’Ivoire, Ghana and Nigeria. The five-year (2011-2016) $13.5 million program is managed by the WCF of which Blommer Chocolate is a founding member. The FCIA was founded in 2007 as a global, non-profit organization focused on providing support to Fine Chocolate professionals via educational programs, networking opportunities, promotional activities, discounted products and services, newsletters, and more.